When you require a unique hydraulic power profile, Rineer vane motors from Rexroth provide high torque at both start and stall and flat torque throughout the entire speed range. Bosch Rexroth continues to help drive innovation in hydraulics technology with the Rineer vane motor. Its patented “vane-crossing-vane” design allows for both low speed/high torque and high speed/high torque operation, resulting in an optimum power-to-weight ratio, smooth output over a wide speed range, and the unique capability to deliver maximum torque at zero rpm. 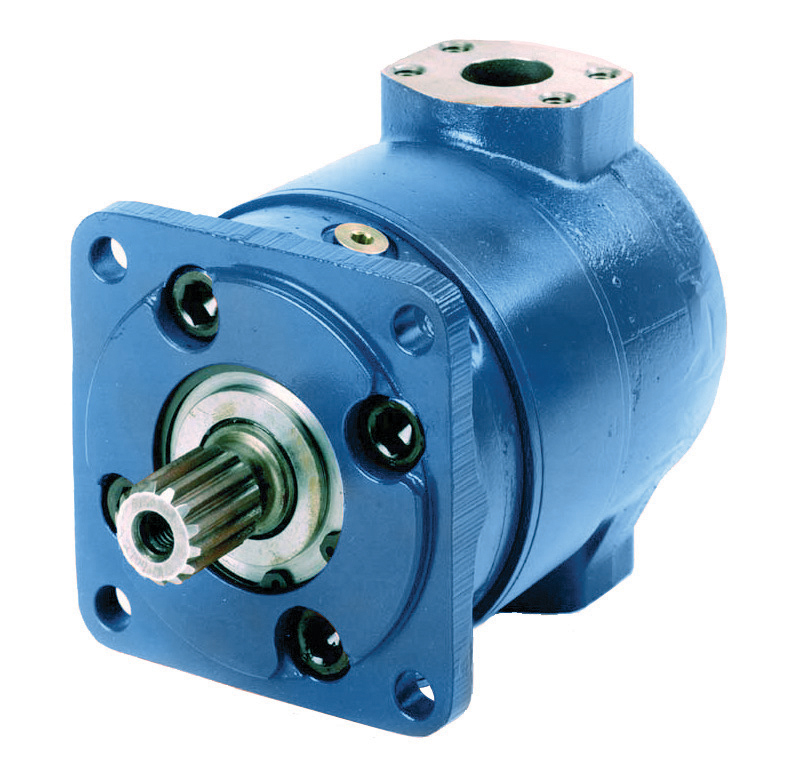 The Rineer vane motor features technology designed to advance the performance, versatility and rugged capability of this unique hydraulic motor to a broad range of applications. 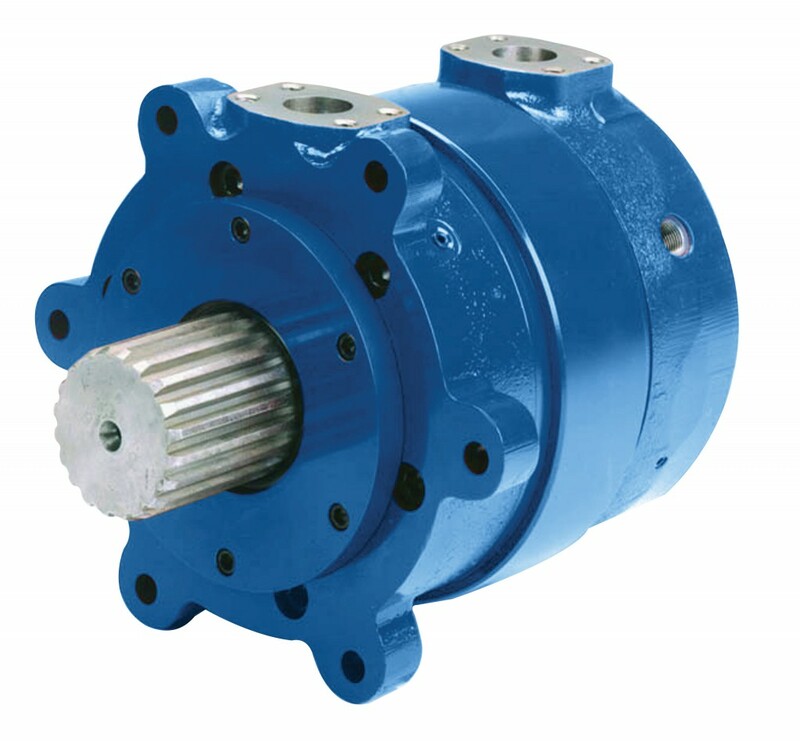 At the heart of this innovative hydraulic motor is a patented vane-crossing-vane design, a revolutionary concept in hydraulic power transmission. The design is a bi-rotational power converter utilizing working vanes in the rotating member and sealing vanes in the stationary member, or stator. These vanes are hydraulically and spring loaded, and are radiused on their crossing edges. The rotor vanes, when acted upon by a differential pressure, exert rotational force on the rotor. As oil enters the “A” ports, the rotor vanes rotate clockwise toward the “B” ports. As each rotor vane is finishing its work cycle in a cavity, another rotor vane starts its work cycle in that cavity. With 10 rotor vanes working in four cavities, the motor provides an uninterrupted torque output regardless of angular position. This design thus delivers 40 power strokes per revolution, providing higher average torque with low torque ripple. The stator vanes function as seals between high- and low-pressure ports within the stator. This allows for more displacement in the stator, giving the Rineer vane motor an optimum power-to-weight ratio. The result: The torque curves are virtually flat with starting and stall torque equal to 90 to 94 percent of theoretical torque. More power strokes per revolution: the 15, 37 and 57 series have 40 power strokes per revolution, while the 125 series has 96. Smooth output over a wide speed range, from less than 10 rpm to 2000 rpm and beyond. Smaller and lighter design: a 15 cubic inch motor weighs only 43 pounds, and the 125 cubic inch design weighs 225 pounds. Starting and stall torque equal to 90 to 94 percent of theoretical torque. 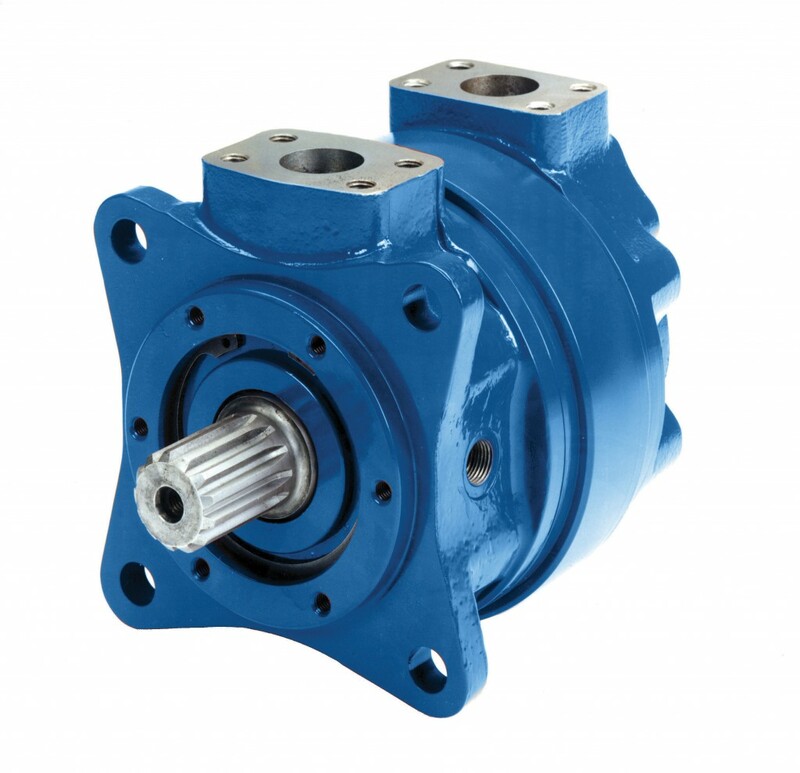 Shaft and bearing options can accommodate high thrust or radial loads, media transmission through the shaft, and special mounts for OEM concerns. A tandem motor option allows two complete motors to be built using one shaft output for greater customizability. A four-ported motor system enables two separate displacements and allows a single motor to operate as a two-speed motor with different shift ratios. Rineer hydraulic motors have been designed and manufactured for decades to meet an assortment of intensive needs. Their distinctive vane-crossing-vane design lends itself to a wide variety of special applications. Whether your industry is oil, marine, forestry, agriculture, transportation, construction or communications, we provide thorough application and design expertise.